Long Beach, Calif. – August 21, 2015 – Formula DRIFT PRO 2 continued to Texas Motor Speedway for the third of four rounds of competition. Alex Heilbrunn takes the victory and secures the PRO 2 championship heading into the final event of the season. PRO 2 continued to Fort Worth, TX at Texas Motor Speedway for the third round of the 2015 season. With only one event left in the PRO 2 season, Heilbrunn has taken a dominant point lead to earn the PRO 2 championship by finding the podium in each of three PRO 2 rounds. The competition between second and fourth in the standings is more competitive with only 8 points separating the three drivers. The top eight finishers in PRO 2 will earn their Formula DRIFT Pro license. The final battle had the number one qualifier and PRO 2 points leader, Alex Heilbrunn in the IMR BMW 3-Series faced Cameron Moore in the VIP Performance / Falken Tire Lexus SC300. 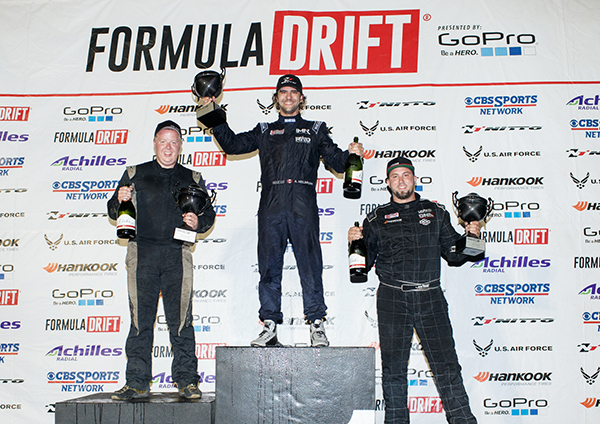 Heilbrunn out drove his opponent on his way to his third podium of the season. Jeff Jones in the DNA Motoring Nissan S14 finished the event in third place. The 2015 Formula DRIFT PRO 2 season will continue to Round 7: Final Fight at Irwindale Speedway. For more information visit:www.formuladrift.com and find Formula DRIFT on Instagram, Facebook and Twitter. Tune into Formula DRIFT on CBS Sports and check your local listings for airtimes.